Trexin remediated a Healthcare Provider’s information technology risks before financial performance and business continuity were negatively impacted. Our Client, a leading full-risk primary care Provider undergoing rapid organic growth as part of a national expansion strategy, had not upgraded their information technology assets to keep pace with the business’ growth and innovation. Over 36 staff model medical centers in eight US markets required better data and controls to provide quality care; applications did not support the aggressive, widespread expansion the affiliate management services organization; and rapid growth had eroded internal audit capabilities and regulatory compliance. Recognizing that her current technology set was not only an immediate risk to the business but also an impediment to the business’ continued growth plans, the CTO asked Trexin to help her remediate the current risk and reposition the company for future growth. Trexin began the project by conducting an infrastructure review, which was quickly followed by a detailed code review of over 600,000 lines of code, which showed serious inefficiencies and outright security risks – the result of over six years of neglect. To address the immediate risks, Trexin then provided software architecture support to streamline application releases and QA reviews and to improve code style and re-use standards. Trexin also provided mentoring to over 30 developers regarding modern coding techniques and code repository maintenance. After the immediate risks were mitigated, Trexin then initiated an enterprise data management effort that resulted in a formal data governance model and process. This data governance was then complemented by a new master data management approach whereby each data element was defined, managed, and controlled by a single authority. Finally, Trexin provided coaching and developer training in Scrum/Agile techniques and created a formal transition plan for all its activities. The immediate risk to the business’ performance and continuity was quickly reduced, and improved software architecture practices resulted in measurable improvements in software quality and productivity. 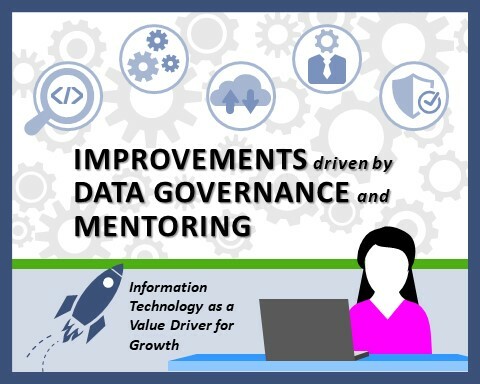 Longer term improvements driven by enhanced data governance and master data management have re-established the importance of information technology as a competitive differentiator and value driver for the business with increased performance and reduced downtime.